For a long time, Egypt has been the heart of the Arab world. It played an influential political and cultural role in the region. Since late 1800’s, Egypt witnessed a remarkable progress in many aspects that made Palestinians and other Arabs view it with admiration. They saw in Egypt their most center of gravity. Palestinians obtained a big share of Egyptian cultural growth (literature, education, arts, sports etc.). Sharing borders, nationality and culture with Egypt, Palestine always attracted many famous Egyptian writers, poets, scholars, actors and athletes. Before 1948, sport was part of the cultural exchange which existed between Palestine and Egypt. Documents show that between the two countries, originated distinguished athletic relations. The numerous sporting events and the cooperation which were based on national brotherhood and Egyptian support to Palestine, gave Palestinian sports an impetus to appear stronger in the region. Not to mention the Egyptian support to the Arab Palestine Sports Federation APSF to join FIFA -International Football Association - in 1946. However, these relations were subject to political conditions in both countries. 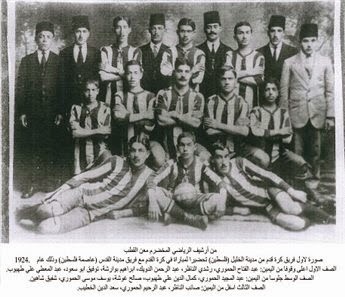 Since 1920's, Arabs and Jews in Palestine sought to attract Egyptian teams and athletes to compete with. Through the period 1920s-1940s, sports in Egypt reached a relatively high level. Some Egyptian champions took part in international competitions and won Olympic medals. The Jewish Maccabi organization in Palestine was concerned to maintain and cooperate with its counterpart in Egypt for sports and intelligence purposes. In general, the Jewish sports organizations sought to sustain their cooperation with British teams in Palestine and Egypt at the same time when the British teams in Palestine continuously had meetings with their teams in Egypt. One of the main reasons in intensifying Zionist sports activities with Egypt was the espionage scheme of the Jewish Agency that recruited Zionist agents from the ranks of the Arab Jewry. In the 1920s, the Jewish Agency set up an espionage network that had branches in the Arab world operating clandestinely behind legitimate front organizations, such as the Maccabee clubs or the intelligence agency with an "Arab" section headed by Moshe (Shertok) Sharett (1894 - 1965). The Mossad established a center in 1937 to train Arab Jews in espionage activities against their own countrymen. The spies were called "the Arab Jews." It was within this frame of reference that Zionist emissaries traveled throughout the Arab world, with the purpose of winning converts and urging support for the future Zionist state. Training camps for prospective emigrants were set up. Zionist sources have understandably always been reluctant to document the record of Jewish resistance to Zionist intervention in the affairs of diaspora Jews. Over the years, many Jewish Arabs informed their governments about Zionist activity, and in reality, Zionists remained a small and unrepresentative minority. In the 1940s, Egypt, Iraq, and Tunisia witnessed a veritable war between the Zionists, whose origins were largely European, and the Arab Jews. Reading the Zionist literature on the history of Palestine as well as the history of sports in Palestine, one might get the impression that Palestine was void of Palestinians. If such histories do mention the Palestinians, they invariably try to depict these Palestinians as lacking any cultural, social, or athletic aspect. They appear to assert that the Zionists populated the region, and graced it with civilization and modernization — that they brought sports and culture to the primitive people who had hitherto known nothing of either of these refinements. Since its founding in 1926, ha-Poel pursued to extend the bridges with the athletic teams in Egypt and the British teams there. Its first match was with the Nadi al-Ittihad al-Tarwihi in 1927. Accompanied by the British Major Hurst (The head of the Maccabee soccer team and the president of the Amateur Palestine Sport Association), in 1932, the Maccabee team visited Egypt and competed with military Arsenal club there and the Hellenic club in Cairo and Alexandria. In March 1931, Filastin criticized Arab teams in Palestine for not showing the desire to meet with the visiting Egyptian University team, stating that “Invited by Palestine Football Association, the Egyptian University team visited Palestine and played against a Jewish team. No Arab team offered to compete with the Egyptian team except the Orthodox Club in Jaffa. 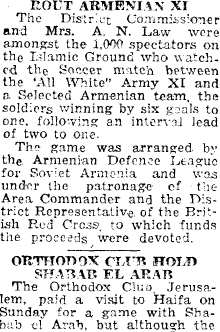 The citizens of Jaffa were urged to attend this match on the 15th of February.”  Also, other clubs were urged to compete with this team for the reason that the Egyptian team was distinguished by a high skill level. 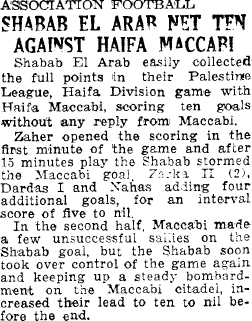 After the game between the Egyptian University team and the Maccabi team of Tel Aviv, in February 1931 the Palestine Bulletin wrote: “The Palestine Football Association is to be congratulated for having brought the Cairo team here." A mixture of soldiers of the British Army and Jewish youth… [T]hey were photographed; between them stood the Governor of Jerusalem and the Egyptian Consul…The flags that were raised on the sides of the stadium were the Egyptian flag, between the English and the Zionist flags… Around the stadium were many British soldiers and Palestine police to maintain security. Arab political and public institutions inside and outside Palestine enthusiastically joined the protest movement from its beginning. The Arab press in Palestine published a protest, which was sent by the Palestine Arab Party and Arab Youth Federation, to the mandate Government for having granted permission for the festival which could only "affect the feelings" of the Arabs. It should be added, however, that some major Arab dailies, especially in Egypt, commented favorably on the Maccabiah Games although no Arab athletes took part in the festival, and provided extensive coverage on the participation of Maccabi Egypt in the festival. Israeli sources today claim that despite the warning of the Arab press against the Games, however Syria and Egypt decided to take part in these Games beside twelve countries, with a delegation of sixty-nine participants from both countries [in the first Maccabiah 1932]. In May 1943, the Egyptian Army team arrived in Palestine to take part in sports games which were organized by the Zionist-dominated Federation of the Amateur Sport Clubs in Palestine FASCP (established in 1931) at the Maccabi field court in Tel Aviv. 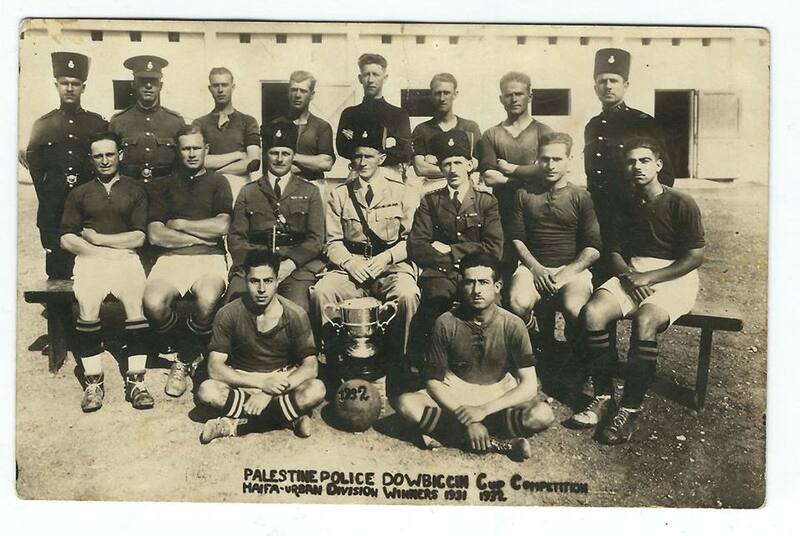 British army and police teams took part beside Jewish athletes representing various clubs. The Egyptian athletes showed high level of skills in games; two of them hit records in some games while others hit records for Palestine. The Arabs in Palestine criticized the Egyptian participation in these games, especially, they came at the time when Arab teams began to withdraw from PFA. For the Arab Palestinian-Egyptian athletic meeting, the 1930' witnessed few competitions between Arabs in Palestine and Egyptians teams. However, meetings were intensified after the re-establishment of the Arab Palestine Sports Federation. As mentioned earlier, the Arab PSF was established in 1931, it functioned until late 1930's, and few Arab clubs took part in Haifa, Jaffa and Jerusalem leagues organized by the Jewish-dominated PFA. However, respectively, in 1943, they began to withdraw from this association. The Egyptian Army (who refused to visit Palestine unless it will have the opportunity to compete with Arab teams) team’s visit to Palestine was an effective incentive that made the Arabs to form a team in Palestine that the Egyptian team could compete with. Therefore, local associations were formed in Jaffa, Jerusalem and Haifa. These local associations were a nucleus for a bigger future association - APSF. In September 1944, the Arab Palestine Sports Federation APSF was re-established. Immediately, it contacted all federations in the neighboring Arab countries, informing them that one of its main tasks was to sustain relations with them. It also sent a special delegation to Egypt to make deals with its teams there. APSF also, decided to sign an agreement with Egyptian coaches who were willing to work in Palestine. Also, it sent letters to all Arab sports federations informing them about the reasons that led to the lack of cooperation with PFA. Later, the meetings and cooperation between Palestine and Egypt have been increased. The Egyptian teams at that time (1944 - 1948) viewed Arab teams as a strong opponent. In August 1945, a team of wrestlers and weightlifters visited Palestine, among them the well-known Egyptian weightlifter Mukhtar Hussein, Muhammad J’essa and the Olympic Champion Khader al-Tuni. The Egyptian team met with an Arab selected team in Haifa, and won 5 to 1. 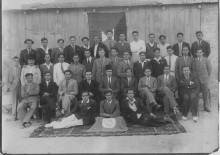 In mid-May 1946, the Moslem Brotherhood invited Dasuqi and his colleagues to Cairo to compete with its teams in different Egyptians cities. Unfortunately, the Egyptian government gave visas only to half of the Palestinian teams. Dasuqi agreed to travel with four of his colleagues; which had a negative impact on the results. [The team] won two and lost two in Mansoura; three losses and one winning in Alexandria; a tie in Port Said. These results were honorable for the Palestinian team, due to its modest abilities. After the re-establishment of the APSF, a committee of boxing, wrestling and weightlifting was founded. It’s a matter of fact, that until that time the Egyptian teams (and all other Arab teams) had to get the approval from the Jewish-dominated PFA in order to meet with Arab teams in Palestine. The Egyptian gradually became aware about the athletic situations in Palestine. However, in April 1945, APSF’s secretary sent a letter to the Egyptian Football Association protesting the meeting between Alexandria selected team and the Zionist teams in Tel Aviv. At the FIFA Congress the vice president read a telegram from the EFA in which it asked for the affiliation of the APSF. At the end, PSF’s application for Joining FIFA was rejected. However, the tireless efforts of APSF were not in vain, because it could introduce FIFA to the nature of the conflict between Arab and Jews and put a fundament for future Palestine's affiliation with FIFA. This was Palestine’s first attempt among five attempts to join FIFA in 1998. No history of Palestinian athletics would be complete without mention of the unique role of Hussein Husni, who came to Palestine from Egypt and, as previously mentioned, taught physical education at Rawdat al-Ma’aref. He also served at the request of the Higher Islamic Committee as supervisor for the schools of the Islamic Orphanage [Awqaf Dar al-Aitam al-Islamiya]. After the re-establishment of the APSF, Husni became a member of its track-and-field committee, and editor of sports news in Filastin newspaper. Husni’s articles reflected an awareness of the essential role of sports and physical education that was rare at the time. He tried to generate interest in physical activity by pouring his knowledge of the benefits of physical exercise into his articles. He also advocated physical exercise for women, and criticized the authorities for their neglect of the body. In one typical article, Husni described the sorry state of Jerusalem’s athletic facilities, where the city had only six playing fields, four for foreigners and two for the Arabs. One of the Arab fields, that of the YMCA, had been occupied by the army for seven months, he complained. The second belonged to Terra Santa and was the site of all matches. “We all ask: ‘Where is the government?’ Others ask: ‘Where is the municipality?’ I say frankly: ‘They are not ready to offer assistance for the benefit of the body.” His and other sports articles were published daily after the revival of the APSF, demonstrating the connection between institutional unity and a strong written message. There is a clear similarity between the period when Egypt was under British colonialism and currently under the Sisi-led military regime. The former sought to provide support and facilitation to the Zionist movement in order to achieve its goals in Palestine, while the latter is taking part with Israel in its restrictions on the Palestinians and their sports. Being under Egyptian administration since the early 1950s, the Gaza Sector witnessed a rapid growth in sports. This administration had no intention to obliterate Palestinian identity. It helped in maintaining the Palestinian identity which at the end had positive impacts on sports growth. The Egyptian administration established the “Regional Committee for Youth Care,” which was headed by the General Governor, and included 25 members, most of whom were sports leaders. The Supreme Committee of Youth in Cairo supported this regional committee financially and technically. Several other committees emerged from the regional committee such as national education and sports committees. Palestinian sport found its way during that period; the Egyptian authorities aided in training and preparing qualified coaches, as well as the exchange of athletic delegations. Proudly, the Palestinians in the Gaza Sector could represent Palestine in the international arena. During that time, Palestine participated in the Pan Arab Games which started in Alexandria in 1953. In 1966, Palestine participated in the GANEFO (The Games of the New Emerging Forces) Games in Cambodia. Issam Khalidi, an independent scholar living in Monterey, California, is author of History of Sports in Palestine 1900-1948 in Arabic, One Hundred Years of Football in Palestine in Arabic and English, Soccer in the Middle East (Routledge), as well as various articles on the subject of sports included at www.hpalestinesports.net. Weightlifter El Sayed Nosseir became Egypt's first ever Olympic gold medalist in July 29, 1928, when he won in the men's 82.5 division. A few days later, wrestler Ibrahim Mustafa took the top spot for the men's Greco-Roman light heavyweight division in August 5. Diver Farid Simaika won the bronze in the men's 3-meter springboard and the silver for the men's 10-meter platform the very next day. Since 1928, Egypt has been winning Olympic medals from time to time but they are yet to establish themselves as one of the most consistent Olympic medal winners. They had a winning streak of three consecutive Summer Games (1936 – 1952) then didn't win anything in 1956. Abdelwahab Elmessiri, The Land of Promise, (New Brunswick, New Jersey: North American, 1977), p. 39. The data in this part, unless otherwise indicated, are taken mostly from the following entries in the Encyclopedia of Zionism and Israel: "Iraq, Zionism in," Vol. I; "North Africa," Zionism in," Vol. II; and "Egypt, Zionism in," Vol. I. Quoted in Abdelwahab Elmessir, The Land of Promise, (New Brunswick, New Jersey: North American, 1977), p. 37. Abdelwahab Elmessiri, The Land of Promise, p. 38-39. In 1924, the leadership of the Jewish Maccabi athletic organization attempted to gain membership in the International Amateur Athletic Federation. This initiative ended in failure as it was determined that Maccabi did not represent Arab, British and Jewish sportsmen in Palestine equally. However, this unsuccessful attempt did not discourage Maccabi leader Josef Yekutieli, who in the beginning of 1925 attempted to gain Maccabi membership in the Federation Internationale de Football Association (FIFA). Yekutieli decided to employ a different tactic this time: he first established the Palestine Football Association PFA. The federation's inaugural meeting was convened in the summer of 1928. Immediately, after being accepted in FIFA, the Jewish leadership started to dominate the Palestine Football Association by ensuring that Jews were the majority in it. This was accomplished by such strategies as imposing the Hebrew language and incorporating the Jewish flag in the federation's logo. Mustafa Kabha, "The Palestinian press and the general strike, April - October 1936: Filastin as a case study," Middle Eastern Studies, 29:3 (2003), 169-189. Issam Khalidi, “Body and Ideology: Early Athletes in Palestine: 1900 – 1948,” Jerusalem Quarterly 27 (2007): 44 – 58. Rashid Khalidi, The Iron Cage: The Story of the Palestinian Struggle for Statehood (Boston: Beacon Press, 2007), p. 9. Haim Kaufman, Jewish Sports in the Diaspora, Yishuv, and Israel. Harif, H; Galily, Y. “Sport and Politics in Palestine, 1918-1948: Football as a Mirror Reflecting the Relations between Jews and Britons” . Soccer and Society, Vol. 4, no. 1, (Spring 2003), p. 41-56. Harif, H; Galily, Y. “Sport and Politics in Palestine. 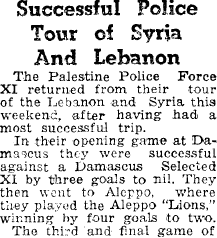 Palestine Bulletin, 17 February 1931. Issam Khalidi, “Al-Maccabiad,…al-SahyuniyyawaIstiqlal al-Riyada,” al-‘Arabino. 548 (2007): 78-87. George Eisen, “The Maccabiah Games”. p. 176. George Eisen, “The Maccabiah Games”. p. 177. Haaretz, April 12, 1935, p. 12; see also Davar, April 3, 1935, p. 1 and April 20, 1934, p. 6. Quoted in George Eisen, “The Maccabiah Games”, p. 263. George Eisen , “The Maccabiah Games”, p. 261. Le Bourse Egyptienne, al-Muqattam, and al-Ahram were mentioning this context by Haaretz, April 12, 1935, p. 12. Quoted in George Eisen, “The Maccabiah Games”, p. 261. George Eisen , “The Maccabiah Games”. Palestine Post, 8 September 1943. Finally, Dasoqi agreed to travel to Egypt in June 1946 to take part in Butulat al-Sharq. He met with Arafa Al-Sayyed who defeated him by points. Adib fell down twice in the last round. This what made Arafa al-Sayyed the winner. Commenting on Dasuqi’a performance the athletic commentator stated that Dasuqi’s performance went well, however, he frequently used his head. Also, he never used his left hand. The game was composed of 12 rounds, every round was three minutes. Filastin, 23 August 1946. The football fields in Jerusalem were those affiliated with the YMCA, St. George’s, al-Rawda, Terra Santa School, Hashmonai, Zion School, al-Umma School, al-Katamon. The games set up by Indonesia as a counter to the Olympic Games. Established for the athletes of the so-called "emerging nations" (mainly newly independent socialist states), GANEFO was the name given both to the games held in Jakarta in 1963 and the 36-member sporting federation established the same year. A second GANEFO scheduled for Cairo in 1967 was cancelled and GANEFO had only one subsequent event, an "Asian GANEFO" held in Phnom Penh in 1966.